This is my first time trying Fennel this way, and boy am I smitten. Fennel has natural licorice-like notes, and braising it in the bacon gives it almost a salty, caramelized flavor that I’m currently obsessed with. And even better, this is something simple enough that any level of kitchen “experience” can put together! Chop the fennel bulb in half lengthwise, then slice horizontally into thin pieces. If Brussels sprouts are whole, use a food processor to shred (approx 12 sprouts). In a nonstick ceramic skillet, cook the bacon until crisp and the fat has rendered. Remove the bacon leaving the fat in the skillet. Crumble and set aside. Warm the bacon fat to medium high, then add a half cup of the fennel. Allow to cook until both sides begin to brown. **TIP: for crispier fennel once it’s done browning, spread it out on a cooking sheet and bake in the oven at 350 degrees for about 10 minutes. 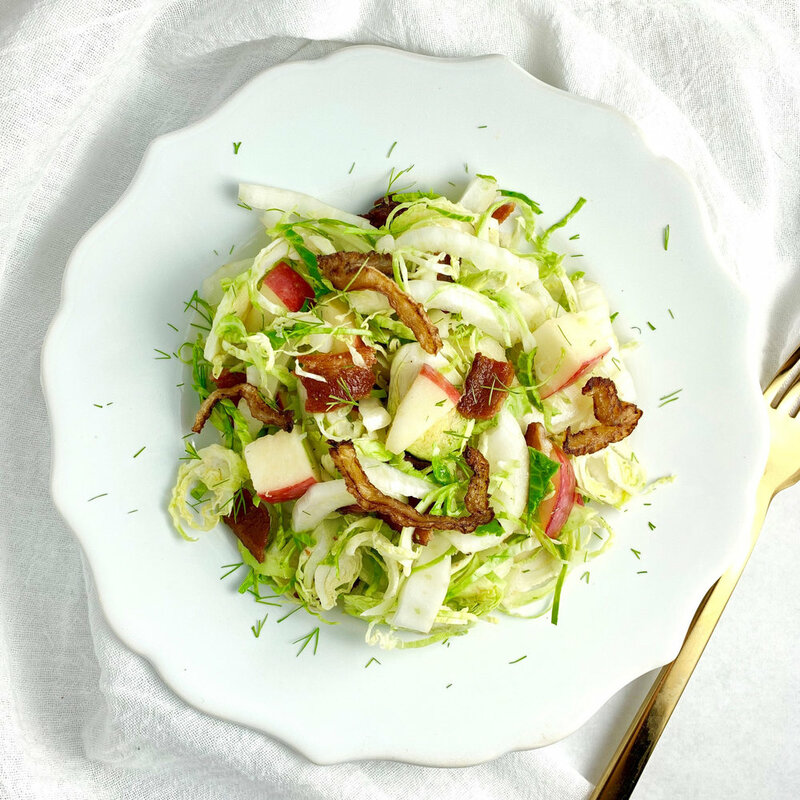 Toss the Brussels sprouts, fresh fennel and bacon to combine. Dice the apple and add to the salad. Add the sweet lemon vinaigrette and toss. Garnish with the bacon braised fennel and fronds. Combine all ingredients in a glass container with a lid (a mason jar works great) and shake vigorously until well combined.